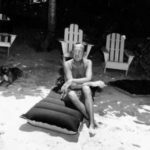 NoÃ«l Coward, the multi-talented British playwright, actor, songwriter raconteur, first visited Jamaica in 1944 on a two week holiday. The and peace of mind he found in Jamaica caused him to refer to it as his “dream island” and he vowed to return one day. Four years later he rented fellow author Ian Fleming’s estate, Goldeneye (as in the recent 007 movie by the same name), located on the north shore of Jamaica in St. Mary’s province. During a six-week stay at Goldeneye he became even more taken with the island and he combed the immediate area determined to acquire an estate of his own. His search for a suitable property kept leading Coward to a place he called “a magical spot” ten miles down the coast from Fleming. It was situated on a slope that lead to a rocky beach and commanded an incredible view of the sea, the Blue Mountains, Cabarita Island and the nearby fishing and marketing town of Port Maria. The property, marked by a small “For Sale” sign was allegedly prone to landslides. Upon further investigation, it was found to have a solid rock foundation, perfectly suitable for building. Coward purchased the eight acres, tucked around a cove in the shape of a half-moon, for a song. 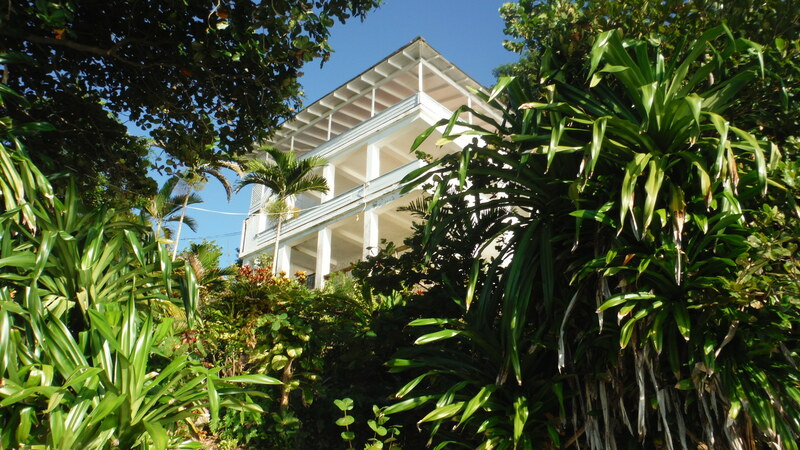 With his architect Scovell he began planning the construction of his Jamaican retreat, which he dubbed “Coward’s Folly”. The building schedule was set and he left the island. Upon his return to Jamaica a year later a two story villa and two guest cottages had been constructed and much of the landscaping had been completed. Inspired by the view of the surrounding Caribbean, Coward named his sanctuary “Blue Harbour”. Coward settled into his new Jamaican house and sent invitations to all his friends. He had a swimming pool built at the edge of the sea into which fresh saltwater could be pumped and then drained. Almond trees and coconut palms provided abundant shade from the noonday sun. By the early 1950’s Blue Harbour was in full swing, staffed by a cook, a chambermaid, several gardeners and a chauffeur. Coward began to play host to a wide spectrum of noted artists, actors, celebrities, socialites and dignitaries. The guest list included Laurence Olivier, Vivien Leigh, David Niven, Alfred Lunt and Lynn Fontane, Errol Flynn, Alec Guiness, Marlene Dietrick, Katherine Hepburn, Mary Martin, John Gielgud, Claudette Colbert, and Patricia Neal to name a few. They flocked to Blue Harbour and Coward’s gregarious personality, some for the day and some for the month as house guests. Jamaica was the place to be and Blue Harbour was an obligatory stop on the North Coast cocktail circuit. Swarmed by visitors and feeling an urgent need for privacy, Coward began to seek out a retreat away from his retreat. With much foresight he had already purchased another beautiful tract of land called “Lookout”, located on a lush hillside one thousand feet above Blue Harbour. Lookout had belonged to Sir Henry Morgan, the infamous buccaneer and first governor of Jamaica. Morgan had constructed a small fortress-like house from which he could spy on any stray galleon that deviated from the main sea route which looped south from Cuba, ninety miles away. He considered the Bay of Port Maria his private domain and seized any ship that wandered into his waters. In 1956, Coward renamed Lookout “Firefly” after the peenywallys or lightning bugs that would congregate and illuminate the night sky. On the grounds, he designed and built a new house geared to suit the needs of one person: himself. He would now divide his time between the bustling social life at Blue Harbour and the peaceful solitude of Firefly, where he would write and paint and enjoy his “room with a view”. In the 1960’s Jamaica was booming as the jet set turned into it’s existence. Fleming’s international spy-thrillers had gained popularity and film crew arrived at Goldeneye to shoot “Dr. No” with an unknown actor named Sean Connery. Fleming took the name of his hero, James Bond, from the author of a classic ornithological tome called “Birds of the West Indies”. Coward has achieved further success performing on American TV and doing his cabaret act in Las Vegas, where he was championed by Sammy Davis, Jr. and Frank Sinatra. In 1965 Elizabeth the Queen Mother visited Blue Harbour and Firefly, where she had a lobster mousse for lunch. Winston Churchill paid his respects several times to Coward and was quoted as saying, “An Englishman has an inalienable right to live wherever he chooses”. After all those delightful years in Jamaica, Noel Coward died there on March 26, 1973 and was buried at his beloved Firefly. His grave overlooks Blue Harbour and his memory lives on. 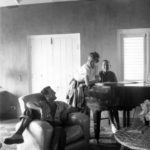 For more about the life of Noel Coward, or his Firefly Estate.